Italian yard Tankoa Yachts has issued an update on its in-build 49.9 metre hybrid superyacht Project Elettra, which has passed a number of construction milestones. 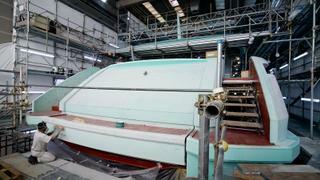 The all-aluminium yacht remains on track for her scheduled technical launch and delivery ahead of the summer season, the yard said. Tankoa has revealed that the final assembly of the VIP cabin is underway, with ceiling panels completed and the cabin ready for the installation of free standing furniture. 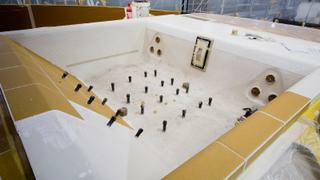 The fly deck Jacuzzi meanwhile has also been fitted and its mosaic tiles laid down. 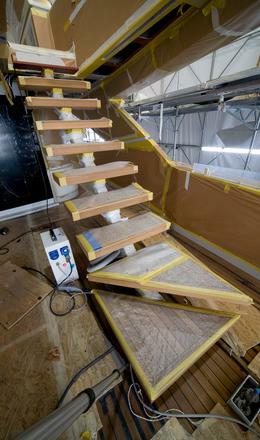 The installation of the exterior ceiling panels on the fly deck is also underway, while the laying of teak forward of the wheelhouse has been completed. As the second hull in the yard's 50 metre series, Elettra will be the sistership to Vertige, but will feature four key differences. These include her status as a "true hybrid yacht" and her five cabins, which include a main deck owners' suite and four guest cabins on the lower deck. Elettra's touch and go helipad will sit on the foredeck while her galley will sit on the main deck, rather than the lower deck. Exterior and interior design comes courtesy of Francesco Paszkowski. The interior decor has been worked on in collaboration with Magherita Casprini and will feature "light modern tones" and "natural materials". The naval architecture meanwhile was developed by Studio Francesco Rogantin. 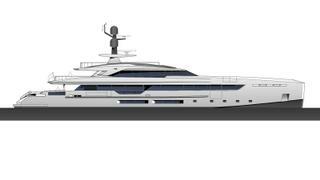 A 9.4 metre beam will allow for a spacious interior without exceeding the 500GT mark. 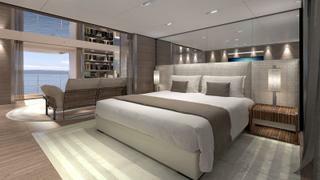 Elettra will accommodate 10 guests in five cabins, comprising three VIP cabins with king size beds and two guest cabins with twin berths on the lower deck. 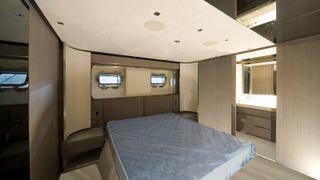 The master suite, meanwhile, which comes equipped with an office and sitting room, will sit on the main deck alongside the saloon, galley and dining room. Other key features include a superyacht beach club back aft, a side-loading tender garage, al fresco bar and Jacuzzi. Power will come from diesel-electric powerplant, which comprises a pair of MTU 8V4000M54 (895 kW) and two electric motors (300kW) driven by two variable speed generators (250kW) for a transatlantic range of 4,000 nautical miles at 12 knots. In "traditional mode", which utilises the use of both main Diesel engines, Project Elettra will be capable of a top speed of 17 knots. The full-electric mode will allow for silent cruising at eight knots while the full speed mode, which uses both main engines and generators, will see the yacht reach a top speed of 18 knots.